They write: “Sassy Cow Creamery is a farmstead milk bottling facility located near Madison, Wis. Our two dairy herds, one conventional and one organic, supply our creamery with fresh milk. Both the farms are owned and operated by brothers, James and Robert Baerwolf along with their families. They are the third generation to farm the land that their grandfather purchased in 1946. James and Robert both graduated from UW-Madison and began dairying immediately after college. Both have all worked with dairy cattle since the time they were old enough to follow their parents around on the farm and this is where their love for cows began. It is because of this background that we place the highest value on the well-being of our animals and every farm-related decision must be good for the cows. The success of the families’ farm is directly related to how well the dairy cattle are cared for. Our families have always farmed with the cows taking center stage. 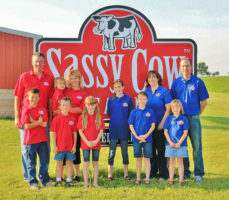 We feel strongly that all aspects of Sassy Cow Creamery should be no different even the brand name conveys the attitude that it all starts with superior cows. Our love for all dairying led us to a unique situation of having two distinct herds, traditional and organic. Our conventional herd has grown from 50 cows in the nineties to the current herd of 450 cows. These cattle live on a new farm site built in 1999 and expanded in 2003. They are milked in a parlor and housed in a sand-bedded freestall barn. During the nice times of the year, cattle are allowed to go out on grass pastures to exercise or lay in the sun. In 2000, we recognized the growing consumer trend of interest in organic foods so we took and grew a portion of our herd using organic practices. This herd consists of 250 cows and they live just one half mile north of the Sassy Cow Creamery location. The organic cows eat a considerable part of their diet from grass on the organic pastures located on this farm.